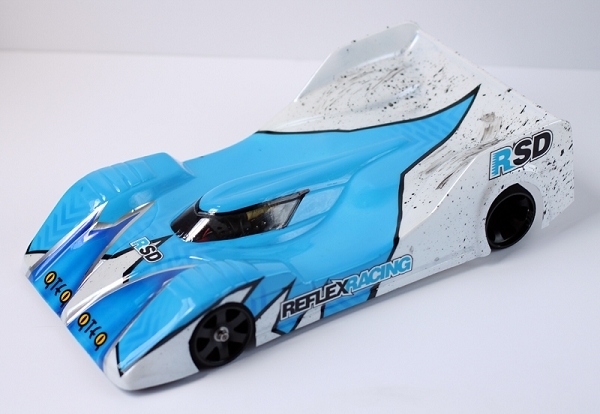 This is a place to share knowledge related to 1/12th scale racing. It is not to be used for conversations. Click links to go to manufacturer product page. If any are missing please add them! https://www.youtube.com/watch?v=hm7z1rz-74s - Special thanks to Edward Pickering! https://www.youtube.com/watch?v=8wqHOLWq6Uc - Special thanks to Edward Pickering! The following information came from http://www.reflexracing.net/12th-Sca...rt-of_b_7.html - with some editing and information added. Thanks Christian! the above are all mounted by BSR and use the same foam. The nomenclature of the BSR vs Jaco/CRC is a little different in a few instances but is otherwise the same. The BSR foam consists of three families, and can be identifed as synthetics, naturals, and blends. Synthetics - The old school, light weight, easy to true "dry feeling" tires. 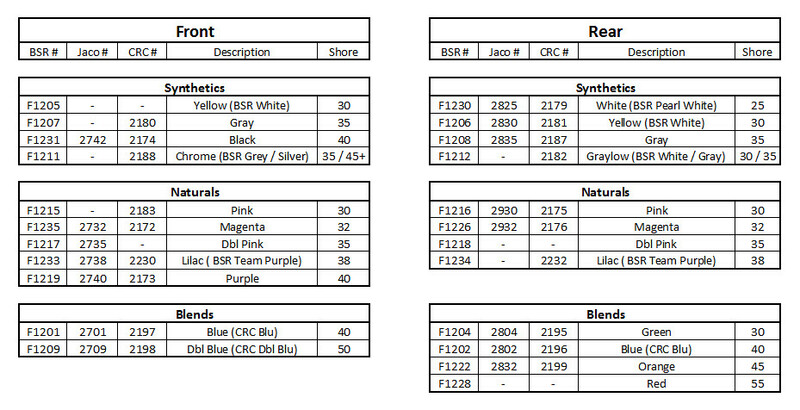 These include tires like CRC/Jaco Yellow (BSR White), Black, Gray, etc. These tires offer the highest wear rate and lowest grip. Many racers continue to use these nder high bite conditions. Naturals - These tires are usually the best alternative for low bite and asphalt. They include Pink, Magenta, Double Pink, Lilac (BSR Team Purple), Purple, and other tires. These tires provide a ton of grip, but tend to get sticky in high bite conditions. This rubber does not wear as easily, and the cars will pick up gunk and fibers from the carpet under most high bite conditions. This is especially bad if the humidity is high. Blends - These are the tires most people run today. They were initially called JFT foam by some, as it was believed that the tires were the same as the JFT tires. We can divide the blends further into two groups: high rubber and low rubber content. The high rubber would be the new rear Orange and Red from the BSR family, and the low rubber would be the Green and Blue varieties. When, asked about the difference, John Foister from BSR Tires said they came from the same family of foam, but they offered different grip. According to John, the Green/Blue has more bite than Orange/Red, but from track testing Oranges offer more bite than Green (being equivalent to in hardness) when the grip is high and absolutely no grip when it is lower. The Orange foam has a denser pore structure and the tire is not as prone to chunking. It is also important to note is that BSR Blue rears are not the same as the BSR Blue fronts. 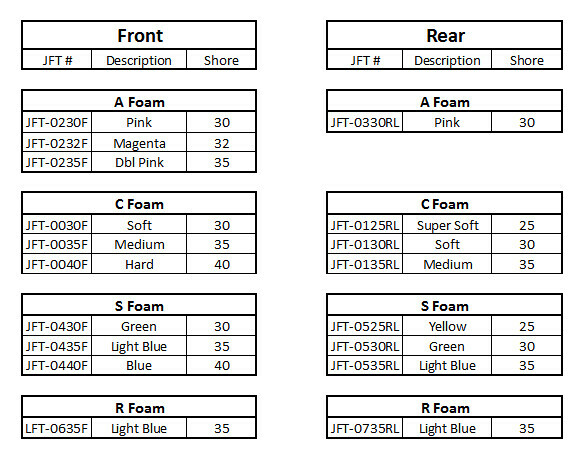 JFT stands for Japan Foam Tire. They started the new wave of foam tires we are all using now (Blue/Blu, Green/Greene, Dbl Blue, etc). These tires are a little different than the BSR tire family, but work in very similar conditions. They currently offer four varieties - A, C, S, and R. See below for an explanation of the different varieties. 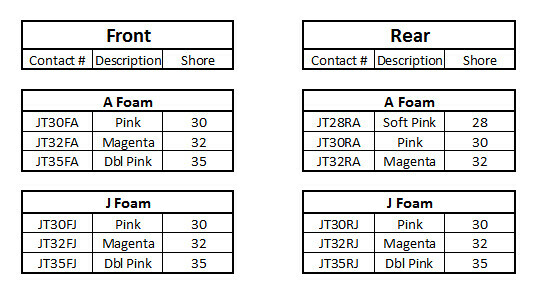 Please note that JFT uses the same foam for fronts and rears, so a C35 front is the same as a C35 rear (for example.) This is different from other brands where a Blue front might be different from a Blue rear. Most people reference JFT tires using a combination of the variety/family (A, C, R, or S) in conjunction with the shore (30, 32, 35, etc.) This is easier than using colours, as there are common colours across the different families (both C and S have a blue, for example. JFT also does offer a stripe spec tire for 1/12 that uses a higher shore A foam with a blue stripe. This tire is comparable to the BSR purple stripe tire, although the JFT version can sometimes feel softer - primarily due to the wider blue stripe that is a softer foam than the BSR purple stripe (actual stripe, not the tire foam. A foam = Pink/Magenta/Purple Family. Used on asphalt and black carpet, considered close to the natural rubber variety and are named consistently with other natural tires. A foam is very good on black carpet, although it will wear faster than other foam types. Common combinations (F/R) are A30/A30 or A32/A30. C foam = C foam is very similar to the BSR Blue/Green foam, or the Ulti X foam. JFT C foam is what started the trend of Blue/Green with Naoto's win at worlds in 2012. This foam wears very well and is good on old grey carpet. Common combinations (F/R) include C35/C35 or A32/C30. S Foam = Think of this as an evolution of C foam. Korey H likes to call them super blue/green. S tends to have better forward bite than C foam, but with better rotation at the same time. As such, S foam can feel a bit more aggressive to drive. S foam wears well, both on grey and black carpet. S, like R, is probably one of the best compounds on grey carpet. S foam can be good on black carpet, but has largely been overshadowed by R foam - since R is a bit easier to drive and has produced well in 13.5. Common combinations (F/R) include S35/S30 or S35/S35. 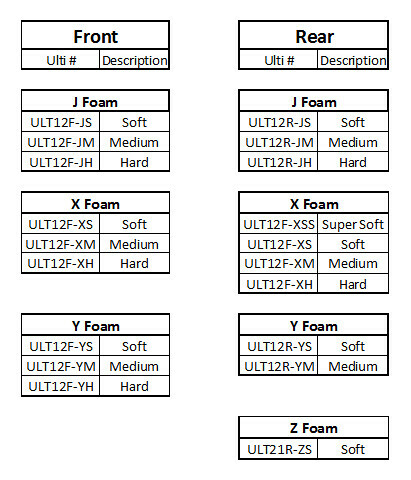 R Foam = These are similar to S foam, which means they are, in-turn, similar to C foam (both S and R are based on C foam.) R foam feels like S foam but just a little more mellow and stable than S foam. R foam does seem to wear a bit better than S foam. R foam has been very popular in 13.5 on black carpet for the past several years. Typical combinations (F/R) include R35/R35 or R35/R30. For general setup, the JFT foam seem to generate more bite than the BSR, therefore the car tends to be a little more aggressive. Ulti is another Japanese brand that offers an array of compounds. They have their own way of rating tires, and are difficult to equate to other brands. They have 4 different varieties, each in varying degrees of hardness. High rubber content tire, similar to Pink/ Magenta. Soft would be close to a pink. X: blend, similar to JFT Blue/ Green. Soft is equivalent to Green, medium to Blue in hardness. Great for carpet High synthetic blend with lower grip, and is not a very popular variety. Z: A very expensive "special" foam that is supposed to be magic on asphalt. Only make it in soft shore. There are many great European foam tire brands that use their own types of foam, as well as traditional foams. Someone with more knowledge about them will need to fill this in. If you are racing on carpet, you have to evaluate how much grip your track has. If your track is low to medium grip, you can run bigger tires. If you are on higher bite you have to cut them smaller, there is simply no way around it. Bigger tires are needed for asphalt, especially in the rear. The larger tires provide much needed lateral bite. Most facilities have moved towards odorless traction additives such as SXT. Some of additives evaporate very quickly and some do not. This seems to be something that is also dependent on tire compound and ambient temperature. For example, saucing a Green compound seems like it never dries, especially when tjhe temperature is lower. We have found that wiping the tires off 15 minutes before we go run allows the sauce to cure, which makes the car come in much quicker with Green rears. Blue compounds on the other hand, do fine when wiped off right before hitting the track. Saucing half front and full rear is a good initial starting point. If the front of the car is too aggressive you can sauce less than half, or for a shorter amount of time. On black carpet the car may be numb to sauce changes, either a long or short sauce can produce very similar handling. In conditions of increasing grip, foam tires will sometimes get sticky and pick up fuzz and debris from the track. This is highly dependent on the rubber sedan tire that is being run at your local track and the compound/ type of foam you are running on you car. The softer the sedan tire and the harder/higher rubber content in your foam tire, trouble with fuzzing seems more likely to occur. There are ways to get around fuzzing under most conditions, and usually involves the selection of the correct foam compound. The more fuzz you get, the softer/lower rubber content you want to run. Problem: Car fuzzes with Lilac/Team Purple fronts and car starts pushing. Solution: Use a softer front tire and or different family of foam. Replace it with Blue or Double Blue front. Alternatively you can sauce the front tires harder and tune the car for less front end bite. Problem: Car loses rear bite 6 minutes into the run. Blue rear tires look almost clean but have small carpet hairs. Solution: Use Green rear tires. The softer compound wears instead of getting sticky, minimizing fuzz. Possibly a longer sauce will prevent fuzzing. Alternatively, mild tire fuzzing can be remedied with longer sauce soak times, particularly if you are using SXT3 as your house sauce. Starting out, pick 2 tire compounds for the front and rear. The following should have you covered 99% of the time. You may wonder about other compounds out there and if they might be better, trust me, they probably won't be. Even if there are other tires that can be as fast, the synthetic family wears out really fast and the high natural rubber will probably fuzz on you over an 8 minute run. The blends family seems to be the most versatile foam type available today. They last awhile, and sticking to them will make your process of tire selection simpler. F1228 RED REAR 30 shore High traction asphalt tracks. Lowest wear / longest lasting. As of now, ROAR is staying 1S (3.7V nominal; 4.2V fully charged) for 1/12. There are many 1S ESC's with a built in voltage booster for proper ESC, servo, and receiver function. so nothing else is required to power the receiver and servo. If you don't want to lock yourself into a 1S specific ESC, you do have other options. It is possible on some ESC models to use your 2S ESC without a booster or receiver pack, and the ESC simply supplies the lower voltage to servo and receiver. If that does not appeal to you, you will need to use an Rx pack or booster. The Rx pack and booster will both supply the receiver with a higher voltage than the 1S pack. If you decide to use an Rx pack, MAKE SURE TO REMOVE THE RED WIRE FROM THE ESC PLUG THAT GOES INTO THE RECEIVER!!! If you choose to use a voltage booster, it works exactly how it sounds. Instead of plugging the ESC into the receiver, it plugs into the booster, and the booster plug goes to the ESC, supplying the higher voltage. If there are any missing please add them. Hobbywing XR10 Pro 1S http://www.hobbywing.com/goods.php?id=538 No motor limit. Trackstar One Cell 120A https://hobbyking.com/en_us/tracksta...-approved.html no motor limit. Hobbywing V2.1 1S http://www.hobbypartz.com/07e-xerun-...-1s-black.html No motor limit with fan. TEAM ORION Vortex R10 Pro Brushless ESC (120A, 1-2S) 3.5 motor limit. DISCLAIMER: The following tuning advice was written based on the tuning experience of the author and may not hold true for all cars, drivers, or surfaces. In the end the best tuning advice is to experiment and make changes one at a time so you can track your changes and find the car balance that works best for your driving style. One real world test is worth a million ‘expert’ opinions. All popular modern pan car front suspensions are very similar, with a few exceptions such as Speedmerchant New School but most of the info in this wiki applies to them as well. For the most part, they consist of a rigid bottom arm, an upper A-arm, and a kingpin with a spring. There are different flavors of this general design, such as the CRC Dynamic Strut that uses a threaded kingpin and upper pivot ball instead of the Associated style that uses a kingpin that goes through the entire steering knuckle assembly, but their operation is the same with the rigid lower arm and the upper arm controlling the arc of movement as the suspension is compressed. More so than in almost any other part of the car, the front suspension of your 1/12 car must move absolutely free. Reamers and hobby knives are important here, as any binding will cause the car to corner unpredictably. A little play in the suspension is a good thing, and racers will often find that ‘worn in’ suspension pieces function a little better than new. Hard Spring (0.55mm or harder): Less overall steering, quick reaction to driver input, less on power steering, harder turn-in with potentially lazy mid-corner and exit. Soft Spring (.45mm): More overall steering especially at low speed, slightly slower reaction to driver input, more on-power steering, less aggressive turn-in but can ‘hook’ and give better mid-corner and exit. It is worth noting that front springs from different suppliers are often very different, in both height, wire thickness, and coils for a given spring height meaning that a “medium” spring from one manufacturer may be the “hard” spring for another. To make accurate changes you may want to use one spring maker and stick with their line. Another aspect to pan car springs is that they can get “blown out” and collapse, no longer as stiff or as tall as they were. These should be replaced with fresh springs to ensure consistent handling. This is generally a minor adjustment, but adding dampening tube fluid to the front kingpins of a 1/12 car can give it a little more initial steering. Often unusual compounds see use here, such as Losi Smart Diff Grease or Associated Green Slime being a popular front kingpin lube. Caster is the angle of the kingpin, almost always angling back to the rear of the car, with a typical range from 0-10 degrees. Increasing your caster will typically result in less turn-in but a little more control, more steering exiting the corner, and somewhat increased straight-line stability with less tendency to wander because a wheel running caster will tend to straighten itself. Basically, more reactive caster =less over all steering. When grip comes way up, sometimes more reactive is better, as it smooths the car out, keeps the car flatter, and can reduce hiking as it pulls caster out as you transition into and through the center of the corner. Caster is what jacks weight in your car and pulls cross weight out when you turn the wheel. Less caster=less weight jacking. Reactive camber or camber gain is how much camber is added the front wheels as the suspension compresses. This can be increased or decreased by changing the angle and length of the top arm. Short, angled arm = more. Long, flat arm = less. More reactive camber will typically cause the car to “roll up” on the outer front wheel, transferring more weight in a turn and give more steering up to the point at which the tire is overloaded. This is generally more front grip and weight transfer than wanted on carpet, and as a result most cars run a flatter longer front arm. Roll Center is the point on which the car will twist laterally or ‘roll’ during cornering. This can be raised or lowered by changing the angle and length of the top arm, with a short angled arm raising is slightly and a long flat arm lowering it. From what I have calculated most modern 1/12 cars meant for carpet have a roll center somewhere around the height of the chassis plate or just below it, but due to the lower arms being rigid and flat the roll center cannot be under the bottom of the tires like it often is on a touring car. These two are inexorably linked in pan cars. Top arm length can be changed by moving the top arm mount in or out using shims or a CRC Long Arm kit, but is generally a minor tuning choice. Tuning of roll center with shims is usually a minor tuning choice in a pan car with a rigid bottom arm due to how the car cannot gain extra mechanical advantage on the lower arm as you can in a touring car, while reactive camber can be a significant driver of the car’s performance. In a modern car running on carpet the kit setup is usually perfectly fine. Static camber is the angle of your front wheels at rest, typically somewhere from 0 to 1.5 degrees on a pan car depending on surface, tire choice, and other factors, but a good starting point is usually somewhere around 0.5 degrees. More camber will typically give more steering, but many racers use static camber to ensure that their tires wear flat even if that means not having exactly equal camber on both sides of the car. This is adjusted by threading in and out the upper turnbuckle or pivot ball. It is also worth noting that when running on high grip the flex and deformation of your chassis, suspension parts, and front wheels can become significant and cause uneven front tire wear. Some troubleshooting of the right combination of static camber, camber gain, caster, and tire/rim choice may be necessary to ensure even front tire wear. The front toe is one of the more easily adjusted aspects of the car and can have a significant effect on the attitude of the car due to it being a quick way to moderately adjust Ackerman without making significant other changes. With nothing else being adjusted, going from zero toe to toe-in will give a car a harder turn-in and will tend to scrub speed with the front end as opposed to using drag brake. This can be necessary when racing in Super Stock or higher power classes and will allow you to drive more aggressively, and can help the car track straighter under power. Toe-out will tend to make the car coast more through corners due to reducing the steering angle of the outer front tire. If a car has too much off-power steering but is otherwise stable, adding toe-out can calm the car but may the car to wander on the straights especially if the front end setup is very soft. Ackerman is the difference in steering angle between the two front tires during a turn. It is the result of how during a turn the inside of the car experiences a tighter circle and needs correspondingly more steering angle, but is also an important tuning tool. More Ackerman means having more inside wheel steering angle relative to the outer wheel, less means that the difference in steering angle is smaller. To add or remove Ackerman, using a servo horn that spaces the links further apart (such as a Kimbrough Small Servo Saver, the outer holes on a Tamiya or Xray servo saver) will have more Ackerman than a servo that puts the links close together (Kimbrough Medium inner holes, Tamiya or Xray inner holes.) The rule of thumb is that a servo that puts the ball studs close together but spaced away from the servo horn will have less Ackerman than one that spaces them far apart and close to the servo horn. Ackerman changes will have the same effect as changing toe with more Ackerman being effectively toeing the wheels out and less toeing them in, but will not affect the straight-line attitude of the car. In offroad or even touring car you can set up the car to use the full angle of the steering 100% of the time. You will almost certainly not be able to do this in 1/12 scale. It goes without saying that as you turn up your steering angle you will gain steering often to the point of the car being undriveable. The quickest way to set the steering correctly is to set the sub-trim in your radio such that the car tracks straight and the servo horn is straight up and down, then set the endpoints equally such that they don't quite hit the steering bump-stops, then turn down the dual-rate or total throw from there. A typical starting point is somewhere between 45 and 60% of the total steering throw, or a 4-5' turning circle. Modern pan cars are all link cars with a center pivot ball and solid rear axle. This suspension system is required by ROAR rules and has the advantage of being simple, lightweight, and inexpensive compared to other more exotic methods of rear suspension, but it has some complicated movements that can be unintuitive. Due to how the rear pod is a solid axle, the only motion the pod itself sees is the main pivot up and down, but due to the main chassis being independently sprung it will feel the lean, dive, and squat of the main chassis as the car is driven. The lateral forces of the main chassis during cornering is transmitted through the main pivot ball and side links, the roll through the side springs and side dampeners, and the squat and dive through the main shock and spring. In addition, the torque of the motor against the pinion gear both during acceleration and braking is significant enough to cause a change in attitude even in low-powered classes. The motor pinion will try to “climb” the spur gear, lifting the center pivot of the car and countering the “squat” of the main chassis weight being transferred backward by the acceleration or the opposite under brakes. The adjustment of the main shock of a pan car is one of its more important tuning parameters. Spring, dampening oil, and pod droop are all controlled by the main shock. A soft main spring generally means more rear grip and more forgiving off-power, while a stiffer spring can mean more steering especially off-power, but the main spring must also be stiff enough to prevent the chassis from dragging when running on high grip. For most cars the kit spring is a medium weight spring that is a good starting point. Also worth noting about the main shock is that if you like the feel of a soft main spring but it isn't hard enough to prevent the car from bottoming out, a bump-stop made from a piece of silicone fuel tubing can be a good solution. The weight of the main shock oil will determine how fast the car will react off-power. 30wt or roughly 300cps shock oil is a good starting point, going up in weight will increase initial off-power turn-in, while going down will generally make initial turn-in softer. Often a heavier shock oil can make the car transition from entry to mid to corner exit smoother, where a car with light fluid may have a more pronounced ‘hook’ in the mid corner. The side springs transfer the roll motion of the main chassis to the rear plate via spring tension. Softer side springs give the car more rear grip and can make the car have a smoother steering feel. Springs that are more stiff promote the cars rotation and give more steering. You can either pre-load side springs or let them float, due to all side springs being progressive beehive shaped springs pre-load makes them effectively harder and will give more steering, but a small amount of pre-load can also make the car more predictable and forgiving. In conditions of extremely high grip, it may be possible to run no side springs at all due to the steering afforded by the tacky running surface and helps prevent traction-roll, likewise in extremely low grip when rear stability is absolutely necessary. 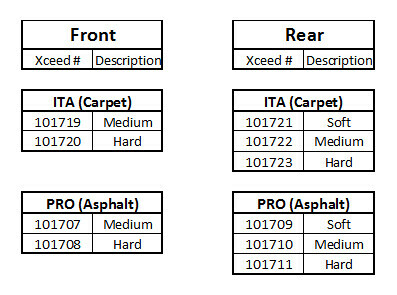 Generally 1/12 cars run soft side springs but stiffer ones can be very common in Pro 10, WGT, or WGT-R. Heavier tube lube will keep a car flatter at corner entry, initiating quicker. It may also make the car square off the corner entry when the grip gets beyond med-high. Going lighter will reduce steering initiation and maybe preferred on higher grip. This parameter is really unique to the driver preference, as some drivers are very fast and consistent with heavily dampened cars while others prefer softer setups. Controlled by the length of the shock, adjusting the rear pod droop is extremely important on high-grip surfaces. Reducing droop prevents the car from transferring weight during cornering and will give more rear stability and prevent traction-roll or problematic lifting of the inside rear tires during cornering, low droop can also give the car slightly more on-power steering. Increasing will allow the car to transfer more weight and dive harder into corners, but by allowing the center of the car to rise you will be more prone to traction roll issues. A typical starting point is 1-2mm of droop from ride height, but 0mm is often used on high grip. All modern pan cars are direct drive and use a ball-diff type solid axle. This is the lightest and most efficient manner of transferring power to the drive wheels, and by far the simplest drive system used in RC. In spite of its simplicity and low number of parts, pan car differentials are often miss-understood, particularly by those who have never raced pan cars before. This short guild will hopefully clear up any misconceptions about assembly, tuning, and troubleshooting of pan car differentials for beginners. It is recommended that you use an electronics cleaner or plastic-safe motor spray to clean the dirt, oils or grease out of even fresh parts to ensure a good diff action. Some racers will blast new bearing grease out of bearings before re-oiling with light oil, but this may not be as beneficial as some believe and that light oil can get into the diff and cause slipping. The most important parts to get clean and dry are the diff rings, diff balls, and spur gear. Then assemble the diff according to the kit instructions, but refrain from adding grease until the next step. When assembling your differential, pay attention to clearances between different moving surfaces, bearings should fit snug and spin free, including the bearing on which the spur gear is mounted because if the spur gear is not tight with its carrier bearing it will not spin true. With the diff assembled but not yet greased there should be a tick of side-to-side play in the spur gear when torqued side-to-side, indicating that the diff balls and not the gear are in contact with the diff rings. Check the action of the diff with it dry, as it will be easier to determine the source of binding or roughness than it would be before greasing the diff. If it turns smooth but with good ‘bite’ between the diff balls and ring gears without slipping, the spur gear and diff balls are ready for grease. Almost without fail racers from other RC classes such as offroad or touring car assemble their first pan car diffs with far too much grease. It is important to understand that the point of grease in pan car diffs is not to smooth out the operation of the components as they mesh together as it is in a gear diff, but to lube the contact between spur gear spinning diff ball. The type of grease to use is white silicone grease such as Team Associated Stealth grease. This is not “good grease” as it is not slippery and does not cushion metal surfaces well, but that is the point, you are counting on the friction between the diff ball and diff ring to transfer all of the power your motor makes to the axle. Using more slippery grease like black carbon/moly grease will make your differential slip. To apply grease, remove the spur gear with the diff balls still in their pockets, and dab a tiny amount of grease to each diff ball, and by tiny I mean that the dot of grease should just barely cover the visible surface of the diff ball, steady hands will be necessary. With the dab of grease on each diff ball, use your thumb and forefinger to roll each diff ball in its pocket to evenly spread the grease on the inner surface of the spur gear. Most of the grease will wind up on your fingers, and that is intentional. This is the most reliable action the author has found to get an appropriate amount of grease into the diff. The next step may be slightly controversial, as we have already removed most of this admittedly tiny amount of grease from the spur gear/diff ball assembly: Take a clean shop towel or rag and firmly wipe down both sides of the spur gear, with the objective of getting all of the grease off from both sides of the plastic gear except for what is in the diff ball pockets. This is necessary to ensure that excess grease does not get onto the ring gears. DO NOT GREASE THE DIFF RINGS, enough grease will get on them to ensure good operation just from the grease left in the diff balls. Re-assemble the diff. A pan car will almost always benefit from the pre-load of the diff only being strong enough to prevent the diff from slipping. A tight or viscous diff like the oil-filled gear diffs now popular in touring car will lead to unpredictable handling and oversteer. Also, over-tightening the diff can damage either the thrust bearing assembly or outside bearing. As you tighten the diff, check how much force it takes to turn the slip the spur gear, if it takes some effort with your thumb, the diff is probably tight enough. Another way to measure if the diff is tight enough is on-track, if your car will spin the tires from a standing full-throttle start before slipping the diff it is tight enough to race. A very common issue is that your diff requires excessive preload to prevent slipping, the most likely explanation is that you used too much grease or some other oil has gotten into the diff in which case a clean-out and re-greasing of the diff would be useful. If you assembled the diff dry and had it didn’t slip, but it slips after adding grease, you need to use less grease and try to keep that grease from getting onto the surface of the diff rings. One option would be to spin up the diff with the motor or by hand, then disassemble and clean the diff rings with motor spray before re-assembling and checking the tension by hand again. This can use the centrifugal force of spinning the diff to remove excess grease from the spur gear. DO NOT simply hold one tire to spin up the diff and other tire to full speed especially if running higher powered classes, this is far more RPM difference than the diff will ever see during racing and may damage your spur gear from the heat. Free-spinning the axle assembly is fine to remove excess grease, but don’t over-speed the diff action. When assembling your diff with the pod, take care to not put pre-load on the pod bearings or this may cause binding. Some racers intentionally put a tick of side-to-side play between the pod bearings and the axle by placing a piece of paper between the hub and bearing before tightening it, this may be excessive but will ensure smooth action without a bind. It has become popular to run a spool, or locked differential, in 1/12 racing on black carpet in all power levels from stock through mod. The reason such a setup can and does work is due to the exact problem the spool is trying to prevent, where in a high-grip corner the inside rear tire can lift off the carpet and cause the car to 'diff out.' Running the spool is not as large of a tuning change as it sounds. Typically a spool will cause the car to be more rear-biased and require a more aggressive front end setup to carry steering. Spools are available from multiple manufacturers and unlike your differentials, you don't need to clean them out and re-grease it before the main. 1: Silicon Nitride diff balls are THE FIRST upgrade the author would recommend to new pan car racers. At under $1 each they are basically the same price as hardened steel and will never need to be replaced, and at nearly diamond-hardness will never flat spot or be the cause of a bad or crunchy diff. One set has lasted the author three different cars. 2: XENON Racing spur gears are the best pan car spur gears. Period. This is particularly true in low-powered classes that use smaller spurs. The plastic they use is distinctly stiffer and better cut than Kimbrough or other softer gears. They do have the ability to take 16 diff balls, but can be run with 8 or 12 and still be perfectly smooth. 3: A diff that uses a dedicated thrust bearing assembly instead of a ‘thrust washer’ that simply pushes against the outer hub bearing have a significant durability advantage. Standard ball bearings are not meant to hold the amount of axial load these diffs require, and when the diff takes a hit such as when you clip a corner with a back wheel that shock zaps right back through that bearing, bending a spot in the race and making the diff feel like it was assembled with diff rocks. The Slapmaster or Yokomo R12 thrust bearing can be adapted to other cars. 4: Unless they are damaged it is generally unnecessary to change diff rings or balls doing general maintenance. A quick clean out and rebuild will do a lot for your diff action. Many instances of diff rings lasting entire racing seasons without issue are commonplace, and haphazardly replacing components looking for smooth diff action is generally unnecessary. 1: Diff feels crunchy – Check your diff balls and rings, if they are clean and fresh check your bearings to ensure that they are smooth and undamaged. A bearing with a damaged race can still spin relatively smoothly, but cause a crunchy feel, especially when you are not running a thrust bearing in your diff. 2: Diff has a tight spot but otherwise smooth - Make sure that your diff rings are flat against the axle and hub, and that they are not bent or damaged. Also, a bent or damaged spur gear can make the diff have a tight spot due to the diff balls being forced into an oval-shaped path instead of a circle. 3: Diff feels smooth before the run but seems to tighten during use, causing the car to go loose -Disassemble, clean, and re-grease the diff. Going too long between rebuilds may cause your diff to go dry and under the heat of racing it will tighten and cause oversteer. 4: Car pulls under acceleration or braking – Check the pod bearings and axle for any bent or damaged components. Also many times a car that pulls under power will have a damaged wheel, make sure that they spin true. On carpet, especially high-grip carpet, running your pack toward the back of the car can make you prone to traction roll or lifting of the inside rear tires in corners. It also will narrow the cars tuning window, amplifying the effects of setup changes and changes in conditions. The upside is that under the right circumstances such as a medium-grip carpet track and high-grip rear tires a rear-pack setup can carry a lot of corner speed by preventing the back from rotating and making it follow the front instead of pivoting on it. Running the battery forward in the car or switching to an inline setup will usually make the car easier to drive on carpet. It takes side-load off the rear pivot and rear tires, which mellows the car and helps to prevent traction roll. The car will usually be less sensitive to tuning changes as well. The static weight distribution the author would recommend to start is about 60% rear, 40% front. A few % change is fine, but try not to have more than 60% on the rear to start as a heavily rear-biased car can begin to be hard to tune. 55%/45% may be easier to drive. Alternately, they just put a spool in their car when they get to Vegas. Don't get me wrong, I love a 3.5/spool/open tire mod car on a good consistent track. It's even better when the track owner/organizers leave a layout down prior to the event kicking off. I know what to do for the most part to drop a car on a foreign track. The gripe about spools in mod is two things: tires are hyper accurate 1-runs and being able to pass accurately in traffic. Those two things alone add up to tire cost and some frustration. I'll admit, when we sat down to the round table to discuss reformatting 12mod, I was a bit resistant. After we all sorted a few variables, we all looked at each other and said: now this fun. Here is a true story from day 1 testing our new format: leading the main, I yelled out to Trav Schreven who was marshaling, you gotta get up here and try this. He hadn't driven 12mod in a year, but on the 3rd lap, he was running the same pace. Trav was blown away how good it was. That day, we went from 3 guys trying something to next week, we had 5. By the Roar Regional, we had 10 cars signed up and racing. Korey won by 5 seconds, I was 2nd, Stuart was third....all within 1.5 laps. I think I used a total of 3 sets of specs. Navigated traffic beautifully with an 8 car field on a 7 second track. Used 1 body all weekend. Just saying. TOADYY, Boomer and LloydLoar like this. 1) very few people have either the skills or the budget that’s necessary to run open balls-to-the-wall mod 1/12th. So it hardly ever gets run on the club level. 1a) I know absolutely nobody who enjoys buying a bunch of different foam tire compounds in the endless hunt for the best traction. Spec tires are SO much easier (and cheaper). Besides, they last a lot longer than soft open tires. 1c) Rarely if ever are club race track conditions grippy enough for open mod. 2) plenty of folks (including me) think 17.5 is just too slow. The racing looses something when it’s possible to keep the throttle pinned throughout most of the infield. Also, for maximum fun, there should be a little “pucker” when going down the straightaway and into the sweeper. The cars don’t need to be so fast that they far exceed the drivers’ abilities. But they do need to be fast enough to provide some thrill and also to require some finesse on application of throttle. 3) This one is the biggie - If guys like spec mod, choose to run it, have fun doing it, and participation goes up.......that pretty much proves the worth and value of running spec mod and that’s all the rationale that’s necessary. TOADYY, Boomer, ShadowAu and 4 others like this. We started running 13.5 at Apex in Nashville about 2 months ago on a regular basis. More for the yes you still have to drive it over a 17.5. Some runs spools some run diffs that are newish to 12th scale. But we have traction that Alexander Hagberg says is better than Snowbirds or Vegas. Tire is open but only because most are running different spec tires left over from big races. I got a bunch of purple stripes and I know some guys were running blue and white stripe and we all seem to be similar speed. Racing more just for the thrill of running 12th scale and a car that turns when you steer. Kemp Anderson wants to run mod but I might talk about the 6.5 with him instead of open mod for the same reason. With Mod most will be put off by the thought of being on the track with someone being able to run a 3.5, but aren't smart enough to choose not to, than anything. Just started to it a month or so now and have 15 guys in a 12th scale FB group to talk about it. Glad it's working for you BB. On a track that size I can understand. It's not very translatable to bigger events on 100' layouts. Even 6.5 runs pretty much WOT with little modulation other than letting off for the corners and slamming the power back on. On anything but tiny tracks it just turns into a really difficult spec class. I'd rather vote for 13.5 or 10.5 boosted to gain back top end without the punch a mild mod puts out. Tell them to put their big boy pants on. Marcos.J, iTz Nicholas72 and silden like this. Track conditions most of us see at a club level aren't comparable to big race grip anyway. I've done pretty well for myself in the modified 1/12 class nationally and I haven't even had access to black carpet until this last year. In order to be successful at any race, you have to adapt to the conditions that are presented to you. With that said..... I was hesitant to the "NW Spec Modified" class, but also found it is really enjoyable. The 6.5T on our track is fast enough that motor wars aren't an issue because it still goes slightly beyond the limits of the chassis and you actually have to drive it.... But it's not ridiculous. With a Gear diff or just a thicker/tight ball diff it drives great and really predictable. Most importantly, the quality of racing has improved dramatically. Cars actually finish, which has been something most can't do modified 1/12 anymore. A spool becomes a serious issue when you are moving throughout the throttle range... which isn't exactly common in 17.5 1/12. It becomes very unpredictable, tracks unpredictably, spins out, pushes randomly, etc. If you're mostly at full throttle like in 17.5, spools are awesome! Navigating traffic is unreasonably difficult, and many unfortunate accidents occur purely because the cars are just doing weird stuff. The "soft" setups people speak of as the "solution" haven't been uncommon in the modified class for several years. Most of the people successful in the class have been setting up their cars like that for a while, far before spool's came into the picture. Honestly, the spool has killed most of my enthusiasm for the class. I see no reason why Xray's F1 sealed gear diff can't be further scaled down to a 12 scale size. Gears seem a bit oversized for my f1. XRay makes a gear diff for 1/12th. Supposedly Fenix makes smaller gears for 1/12th. But if you are good with a dremel you can make any gear work of there diff. (kimbrough and crc- for sure). I've done them both and they work fine! The lowest gear you can get for the X-Ray gear diff is 76T. Buckland is correct. again if you are good you can make any gear to work on the xray diff.. I'm not but the guy at my local hobbyshop was..